This will be a long question, so bear with me, I have some explaining to do. So I've been working on this comic book shader for a little bit. I've gotten it looking the way I want it so I don't really need critique unless you see something glaring that I overlooked. But I am a little unsatisfied with the execution. 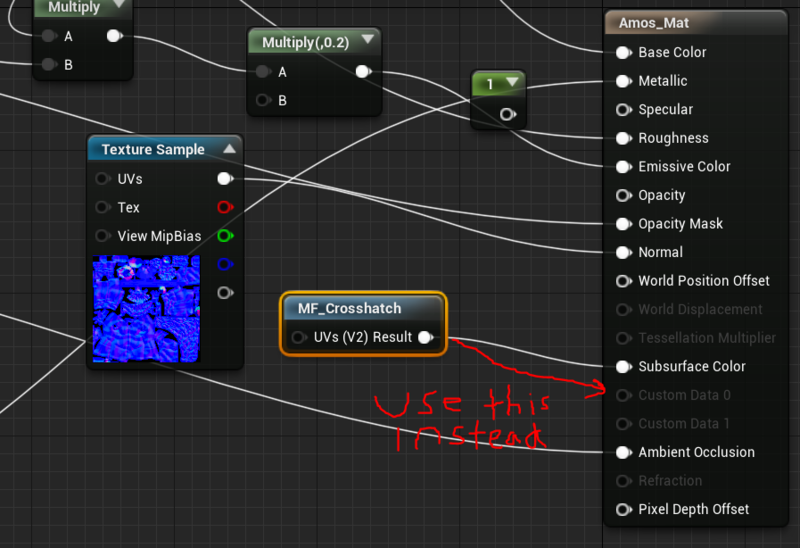 So I wanted the textures to be in UV Space instead of world space. 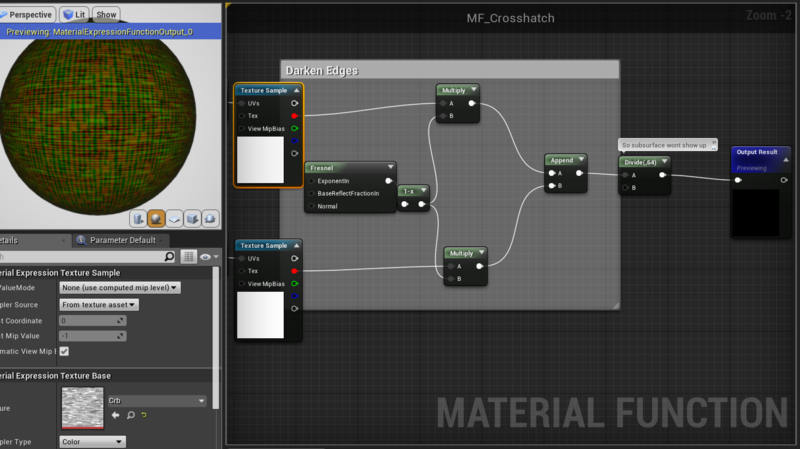 So I needed to have a way to get the crosshatch textures to appear in my post process scenetexture. I messed with a few methods, but in the end i settled on having the crosshatch be a material function, the thing is The only way to have it appear in my PostProcess is to have it be in the subsurface channel, I split it into the red and green channels so i can control the vertical and horizontal lines independently: I also divided it by 64 so my subsurface wouldn't appear all green That node makes the scene look like this which i can use in my PostProcess: Then I do some work to make it only show up in the darkest parts of PostprocessInput0: Which I overlay onto my original scene to get this: The obvious downside is that I can't use Subsurface scattering. 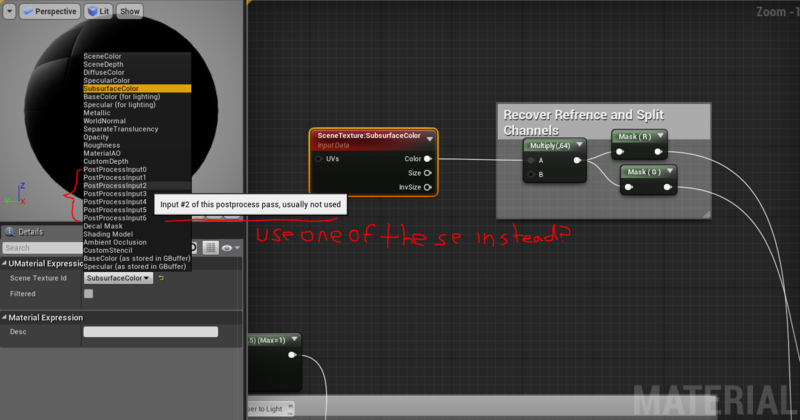 so I'd like to know if it's possible to plug it into a custom output: And have It read on on one of the SceneTexture PostProcessInputs: I know PostProcessInput1 is for Emissives and PostProcessInput2 is sometimes for Bloom, So If I could just Put it in one of 2-6 If anyone knows a way I could Spare my subsurface output I'd really appreciate it. This effect looks great on dark scenes, but it's possible to see the subsurface color on really bright scenes, ruining the effect. I tried figuring out how they made a similar crosshatch shader for borderlands 3, but I assume they wrote a lot of their own custom stuff for what they made. Why is my material not showing the same result as my material function? Can I change the transparency of post process material?